Phobos ransomware returned after a year break. It uses sophisticated AES to encrypt data and infects various system files to keep the malware running at all times. 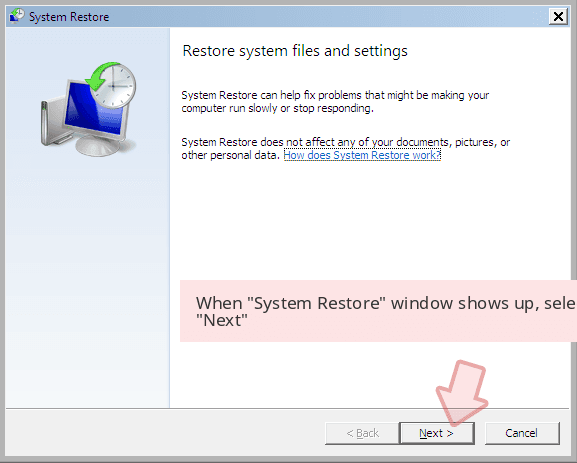 To restore the computer to a previous state, download and install PC repair software. Phobos ransomware is a file locker that first emerged in 2017. Nevertheless, malware came back a year later with two new variants. 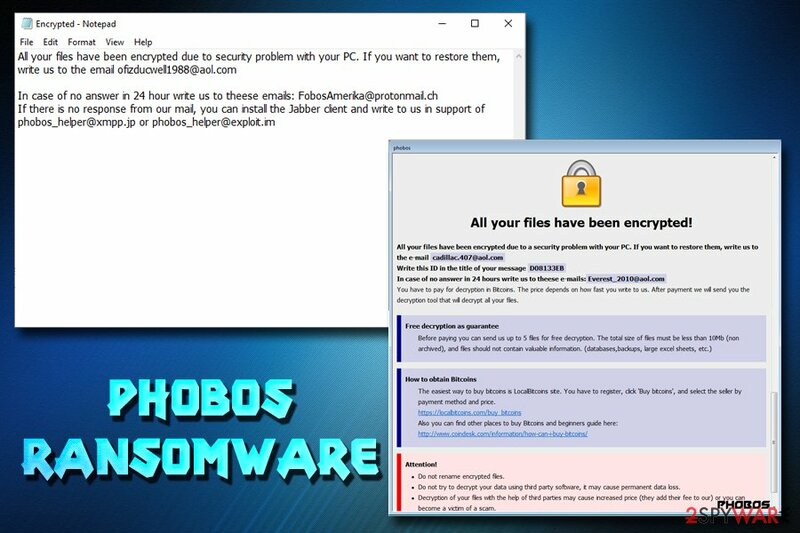 Phobos ransomware is a file-encrypting virus that comes from a large Dharma family and was discovered by security researchers back in October 2017. Since its initial release, malware went under the radar for more than a year, until new variants started emerging in quick succession at the end of 2018. Initial infection used .[ID]. [email].PHOBOS file extension dropped Phobos.hta note and asked victims to email via OttoZimmerman@protonmail.ch to find out the amount of ransom that needs to be paid in order to retrieve access to locked data. Later versions kept the extension .phobos, but used different contact addresses, along with the composite extension. The most recent contact emails used are ofizducwell1988@aol.com and FobosAmerika@protonmail.ch. Currently, Phobos virus is actively attacking users all around the world, asking for as much as $5,000 ransom in return for the decryptor. File extensions [ID]. [OttoZimmerman@protonmail.ch].PHOBOS, [ID]. [Job2019@tutanota.com].phobos, [ID]. [Cadillac.407@aol.com].phobos, [ID][Raphaeldupon@aol.com].phobos, etc. Phobos ransomware virus mostly spreads via malicious spam emails or fake installers (processhacker-2.39-setup.exe) for applications like Process Hacker 2. 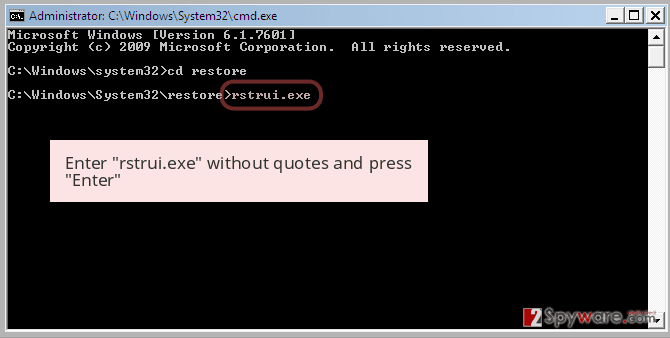 Once inside the computer, it starts scanning the system, targeting the predetermined file extensions. Malware encrypts various pictures, multimedia, images, databases and other data using AES cryptography. Thus, files locked by Phobos ransomware cannot be opened without a specific decryption tool. In the ransom note, criminals explain that the information stored on the affected computer was “turned into a useless binary code.” In order to make victims to follow the ransom payment instructions, crooks tell that other third-party data recovery services will not help them. However, they might take the money and disappear. Though, this situation is most likely to happen if you contact and transfer the money to authors of the Phobos virus. It seems like the virus is gaining success of receiving payments, as Phobos ransomware developers already received 3.5 BTC ($13,257 at the time of the writing) into their Bitcoin wallet. It once again proves that the ransomware business model is extremely successful, and these type of infections will not go away anywhere. For that reason, using comprehensive security measures is a necessity. Hackers behind Phobos ransomware warn victims that, in case the ransom is not paid within a specific period, the size will increase significantly. However, cybersecurity specialists do not recommend contacting criminals and following their instructions because it might result in money loss. If you got infected with the virus, do not panic, stay calm and focus on Phobos ransomware removal. Trojans and ransomware often operate together to proliferate even more malware on the machine. Thus, Phobos ransomware infection might not only damage your files but corrupt the system as well. 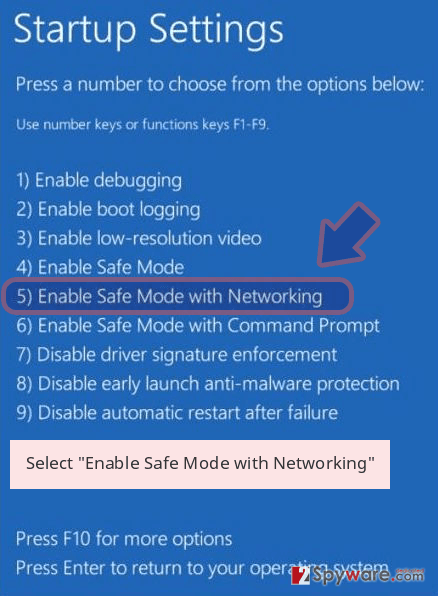 However, you should not try to eliminate malware-related files manually. To remove Phobos ransomware safely and successfully, you have to obtain a reputable software and terminate the virus within several minutes. As soon as malware is eliminated, we suggest you scan the machine with Reimage as it can fix all the damage done by Phobos virus. 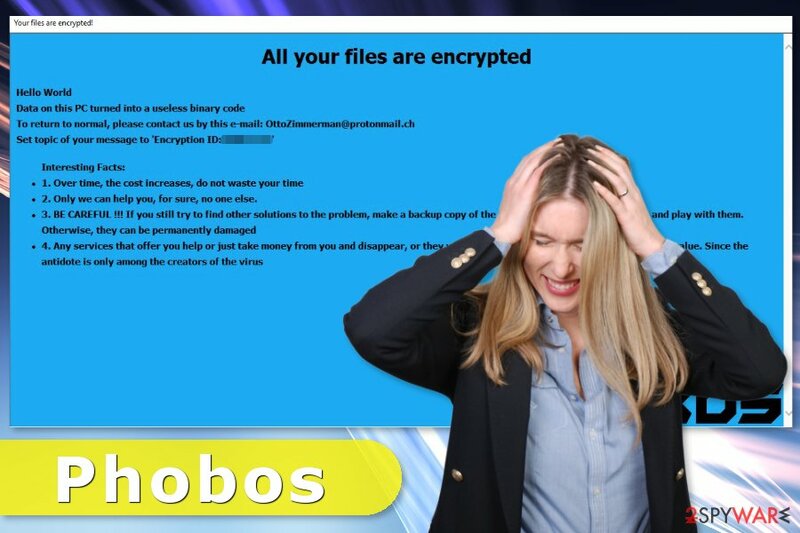 Once all files are encrypted, Phobos ransomware virus delivers a ransom-demanding message. The crypto-malware can get inside the device when a user clicks on a malicious link, opens or downloads an infected file. The malware executable can be included in the email or presented as a useful program in various torrents or download sites. Thus, users have to be careful and avoid questionable content online. Never open spam emails and stay away from the attachments included into an email that is sent from unknown senders. Do not download illegal content. Stay away from pop-ups informing about available updates. Do not download software from untrusted or unauthorized sources. Install a reputable antivirus program. Keep all your programs updated. Security experts from Norway suggest creating backups and updating them regularly. Unfortunately, sometimes it’s impossible to decrypt files with the third-party software. Therefore, having backups prevents from data loss. Trying to locate and wipe out malware-related files manually might end up with serious damage to the system. Therefore, we do not recommend risking to delete wrong files. It’s better to dedicate Phobos removal for the professionals. We mean, you should obtain a reputable malware removal software, such as Reimage or Malwarebytes MalwarebytesCombo Cleaner and get rid of the cyber infection automatically. However, ransomware might be resistant and block security programs. 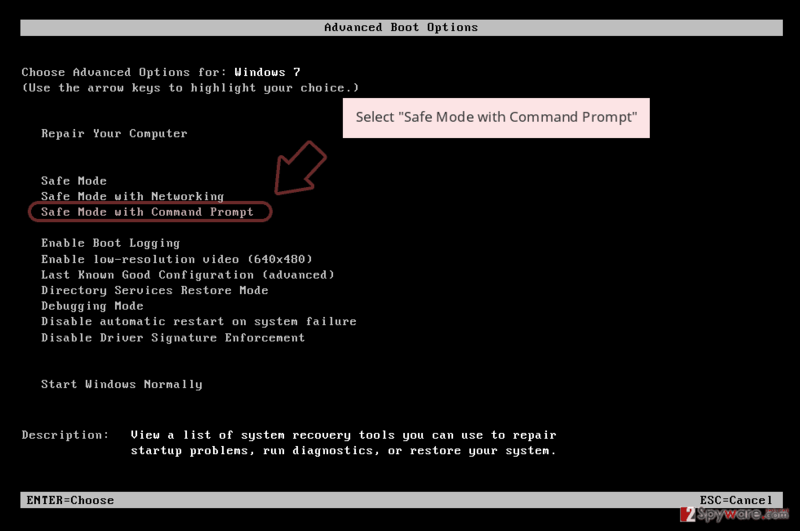 For this reason, you should reboot the computer to the Safe Mode with Networking first in order to remove Phobos ransomware virus entirely. You can find the instructions below. Log in to your infected account and start the browser. Download Reimage or other legitimate anti-spyware program. Update it before a full system scan and remove malicious files that belong to your ransomware and complete Phobos removal. 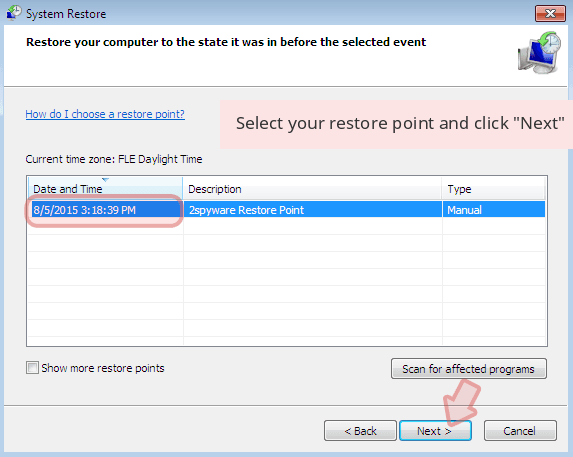 When a new window shows up, click Next and select your restore point that is prior the infiltration of Phobos. After doing that, click Next. 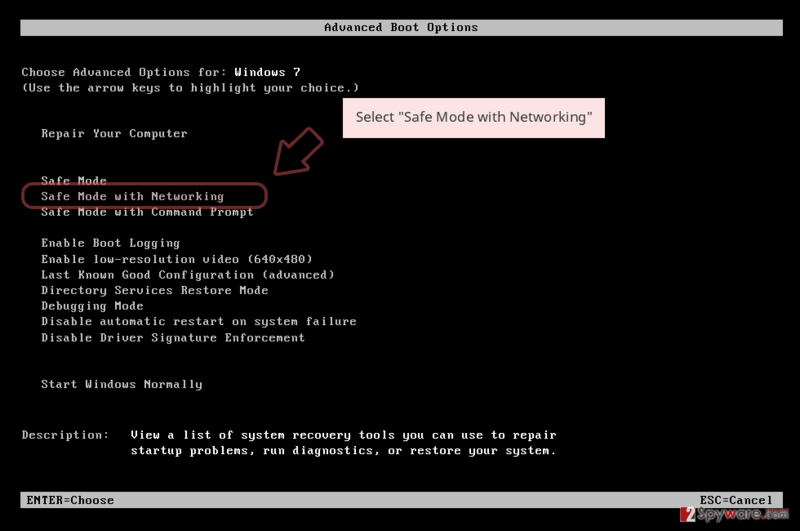 Once you restore your system to a previous date, download and scan your computer with Reimage and make sure that Phobos removal is performed successfully. 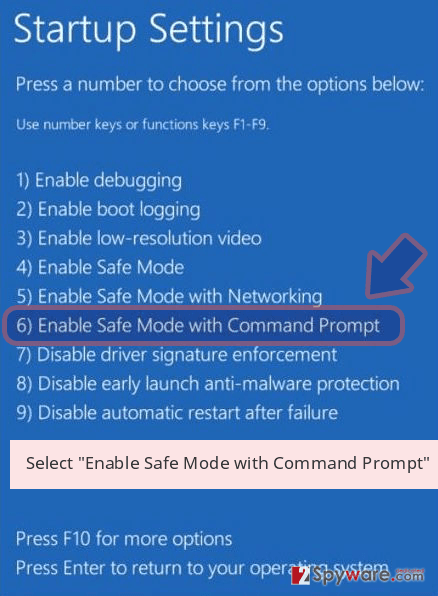 Guide which is presented above is supposed to help you remove Phobos from your computer. To recover your encrypted files, we recommend using a detailed guide prepared by 2-spyware.com security experts. Only backups can help to restore all files encrypted by ransomware. However, we highly recommend trying alternative third-party tools that might help to recover at least some of the lost data. Originally, this software is designed to recover files after the system wreckage. However, it might be helpful after the ransomware attack. Phobos decryptor is not available yet. ^ Jessica Kim Cohen. 10% of spam emails are 'malicious': 4 things to know. Becker's Hospital Review. Hospital business news and analysis for hospital and health system executives. ^ Tom Warren. Hackers hid malware in CCleaner software. The Verge. American technology news and media network. ^ Bitcoin Address. Blockchain. Digital wallets. ^ Viruset. 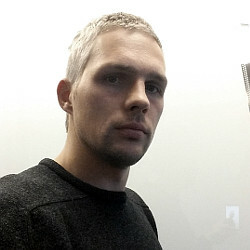 Viruset. Norwegian security news. This entry was posted on 2019-02-07 at 07:33 and is filed under Ransomware, Viruses. You can quickly scan the QR code with your mobile device and have Phobos ransomware virus manual removal instructions right in your pocket. How did you remove Phobos virus?